Early last October, UVic launched the Global Reputation and Rankings Project (GRRP), an initiative to strengthen UVic’s standing with internationally prominent ranking organizations with $168 000 allocated exclusively for Illuminate Consulting Group (ICG), a third-party firm based out of California. The year-long, two-phase project will conclude this fall, and comes as UVic’s overall international ranking trends downward in some of the major global rankings. In 2012, UVic sat at numbers 299 and 177 globally in the QS World University Rankings and Times Higher Education rankings, respectively. In 2016, they had fallen to 325 in the QS rankings and sat in the 301–350 bracket in the Times rankings. And now, in spite of the investments already made, they fell in last year’s QS rankings to 346 and failed to improve from the 301–350 Times rankings range. But the GRRP (which targets both the QS and Times rankings) has drawn criticism in regards to UVic’s priorities and allocated resources for this project, particularly in light of next year’s 20 per cent tuition increase for incoming international students passed by the Board of Governors in March. With four years of experience as a student senator, David Foster recognizes the value of a strong international reputation in attracting instructors, researchers, and students. However, he raised concerns that focusing on its global reputation may lead to UVic significantly increasing funds for international outreach and promotion at the expense of supporting students on campus. Although a university’s reputation is assessed through multiple factors, a high global ranking is pivotal according to Carmen Charette, Vice-President of External Relations and Executive Lead for the GRRP. “It’s become the easy, go-to way to measure where you stand internationally,” said Charette. UVic placed second among comprehensive universities in Maclean’s 2018 Canadian rankings, but ICG stated that the university’s access to global connectivity, resources, and talent was threatened by their exclusion from the top 200 and 300 of global rankings. 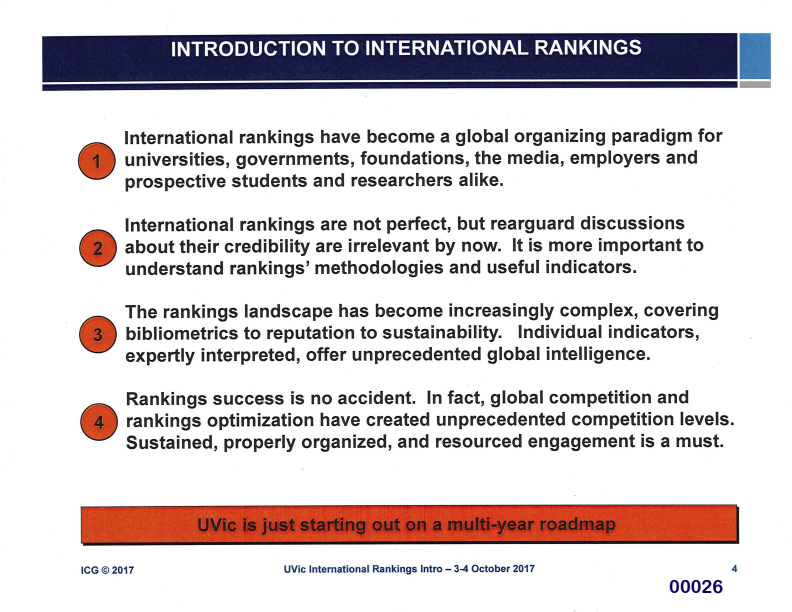 In a presentation from ICG shown to UVic administrators in October 2017, the firm said that international rankings influence eligibility for scholarships and international research collaboration, mould employer perspectives, and determine the quality of students and researchers at a university. The results of some ranking surveys don’t accurately reflect UVic’s reputation for Charette, particularly with regard to research programs. 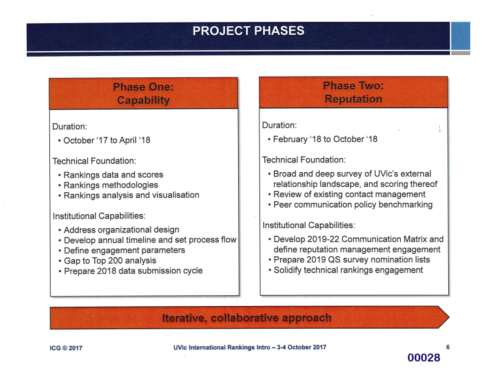 Through working with ICG on phase one of the GRRP, UVic aimed to ensure their data submitted to international ranking groups was as accurate and complete as possible to improve their position. 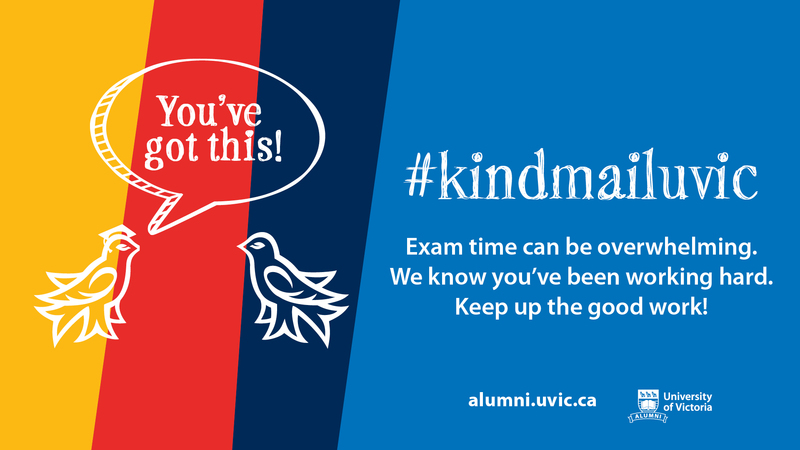 In phase two, UVic sought to improve their global awareness by reaching out and strengthening relationships with international partners and other institutions—something Foster would like to see more of. “I do think this project could incorporate strategies to position us more prominently in the world — so that instead of being seen as on the remote edge of Canada, we are more of a midpoint in the meeting of research and scholarship from North America and the Asia-Pacific region,” said Foster. However, he remains cautious about the investment in GRRP. “It’s important that we keep a perspective so we don’t pour resources into ‘reputation enhancement’ at the expense of funding teaching, research, and student services on campus,” said Foster. 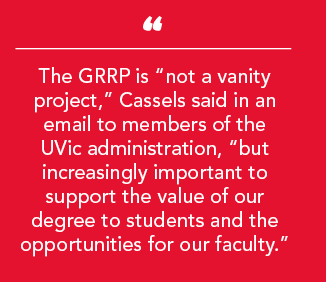 It’s in phase two of the GRRP that Angelblazer foresaw that UVic’s prioritization of their reputational advancement will come at a cost—specifically, the increased tuition for international students. Angelblazer found an example of this in the Board’s most recent budget proposal in March, which proposed a raise in incoming international student tuition fees “to reflect the quality of our degree programs and therefore to be priced among our peer group.” In addition to the 20 per cent tuition increase passed, the budget included another 15 per cent increase to be implemented the following year. “It seems as if the main reason for the increase is that UVic feels that its degree is simply worth more and so they’re able to charge more (which would be fair if you were a business and not a public institution),” wrote Angelblazer in an email to the Martlet. In defense of the tuition increase, Charette said that UVic international fees remained competitive in comparison to other Canadian universities. UVic will communicate key findings from the GRRP upon conclusion of the project this fall. However, Angelblazer remains worried that this strategy to enhance UVic’s reputation will ultimately amount to more about finding creative ways to charge students increased ancillary and tuition fees than the university marketing itself — especially given the past track record of initiatives such as UVic Edge and CARSA. “If the university were to show that they’re able to care about their students, not waste their money, and listen to their needs I feel that it would go a lot farther to advance their reputation than many of the other projects that they might be working on,” said Angelblazer.